ColourPop recently launched a My Little Pony collection and the best part...they used the "vintage" My Little Pony cartoons from the 80s which I grew up on! I was so so jealous of the PR packaged they sent out to the big YouTubers. There was an option to purchase all the items in the PR package, but it was $135 and that's just too steep for me especially when I didn't like any of the lippie shades and, especially when I knew they were giving them out for free. Anywho, the eye shadow palette is the item that interested me the most so that's what I decided to get. The packaging is absolutely adorable. And it came with some stickers, bestill my 80s kid beating heart! Here is the outer box. 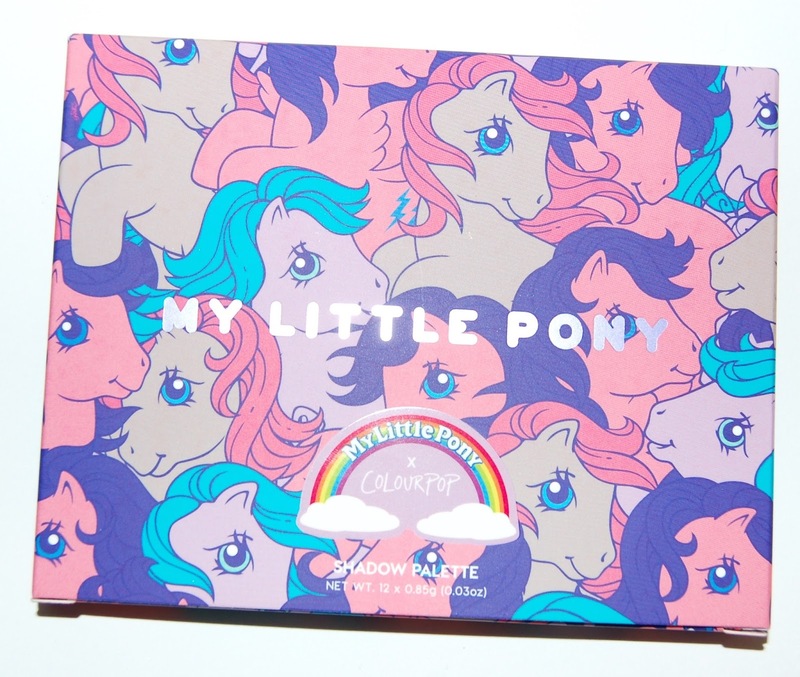 And here is the palette itself, I absolutely adore the 80's ponies and the logo! 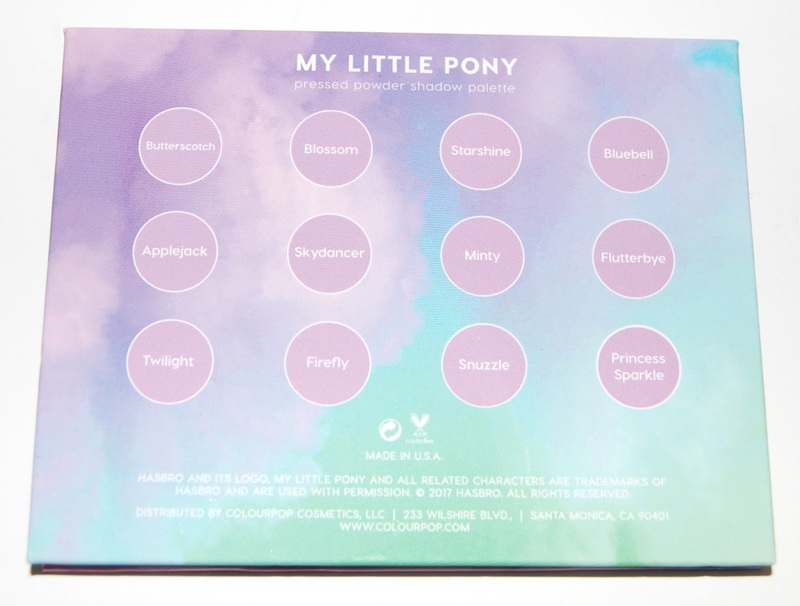 The shadow names are on the back of the palette. And here's a close-up of the shadows. There are 4 mattes and 8 shimmers. The size of the shadow pans are smaller than most eye shadow singles. 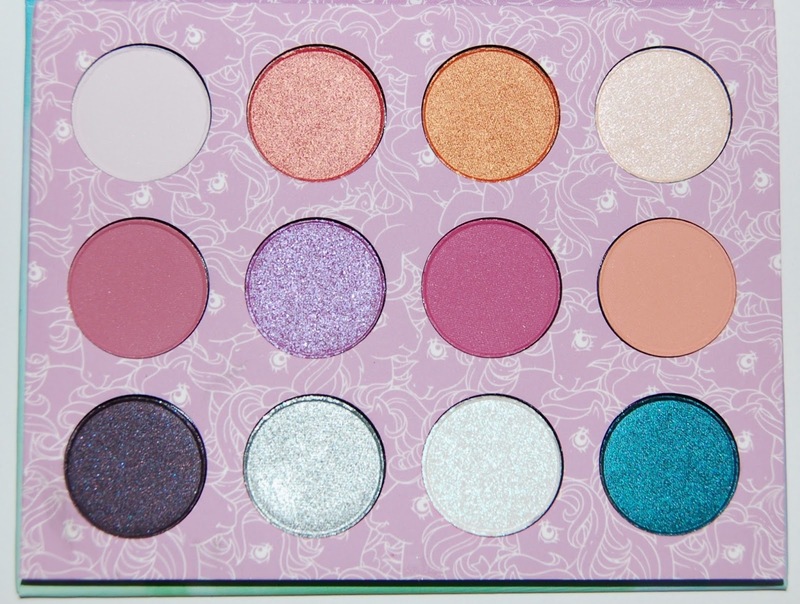 There are so many beautiful bold jewel tones in this palette! All of the shadows are pigmented and easy to blend. The shimmers all apply best with your finger. The lavender shade, Skydancer, is absolutely gorgeous but had to be built up a lot (as did the other shimmer shades), even when I applied it with my finger. I do wish there were some more neutral/brown matte shades. The matte shades are pink or peach so all of the looks I created had a pink vibe to them, even when I used the green and mint blue colors on my lids. 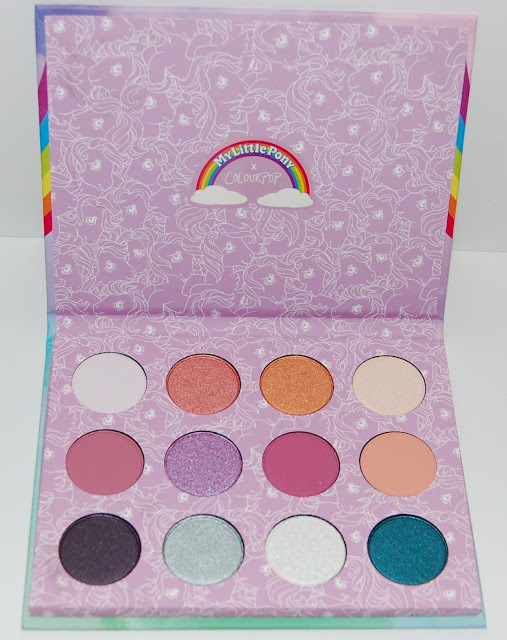 Overall, I really like the ColourPop My Little Pony Palette! Like the Yes, Please Palette, the shadows aren't the best quality I've tried, but for $16, this palette is an amazing value and I really recommend it! 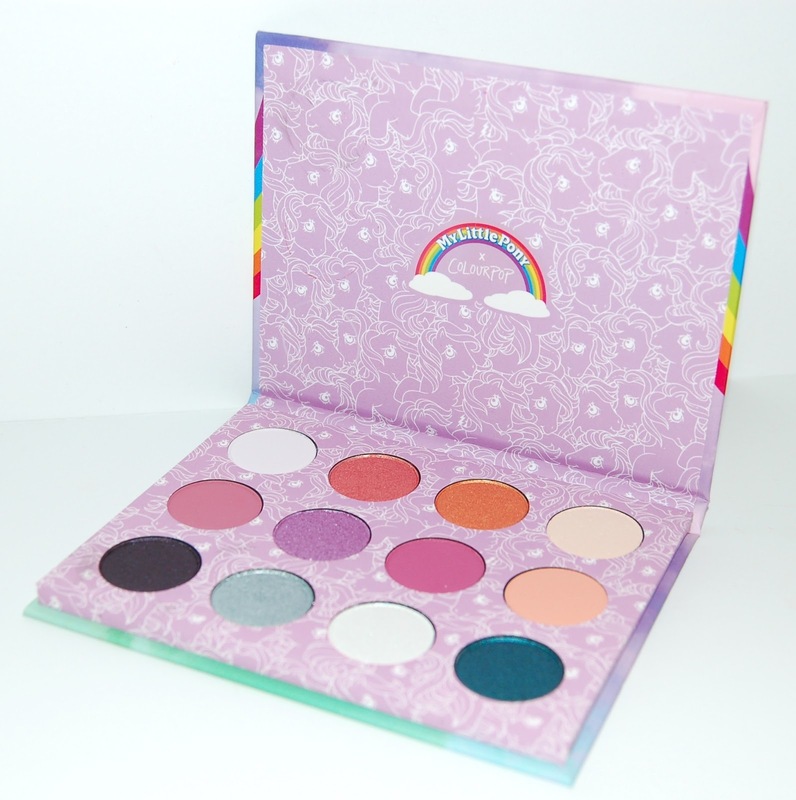 I know this is a limited edition palette, so if you want it, I recommend purchasing it now because you never know if ColourPop will bring it back! 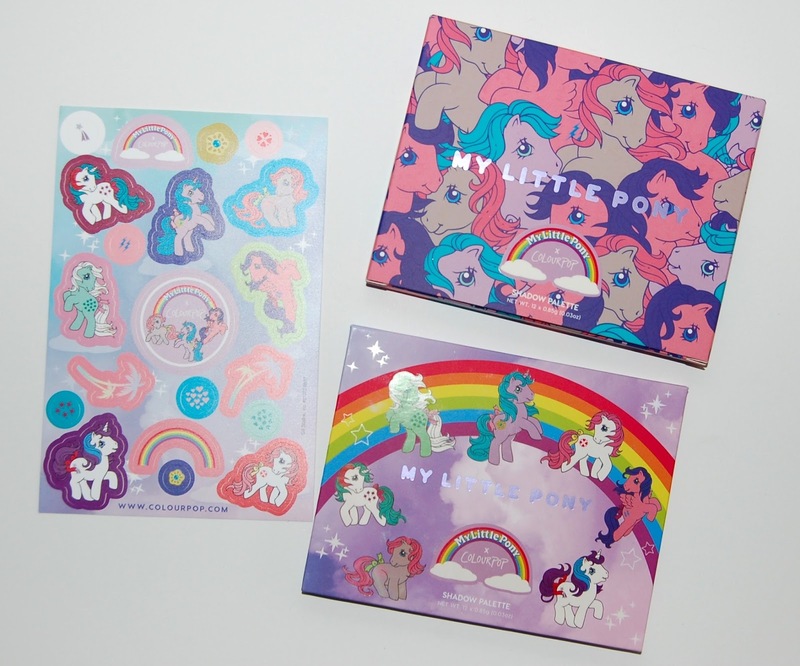 Did you get anything from the ColourPop x My Little Pony collection? 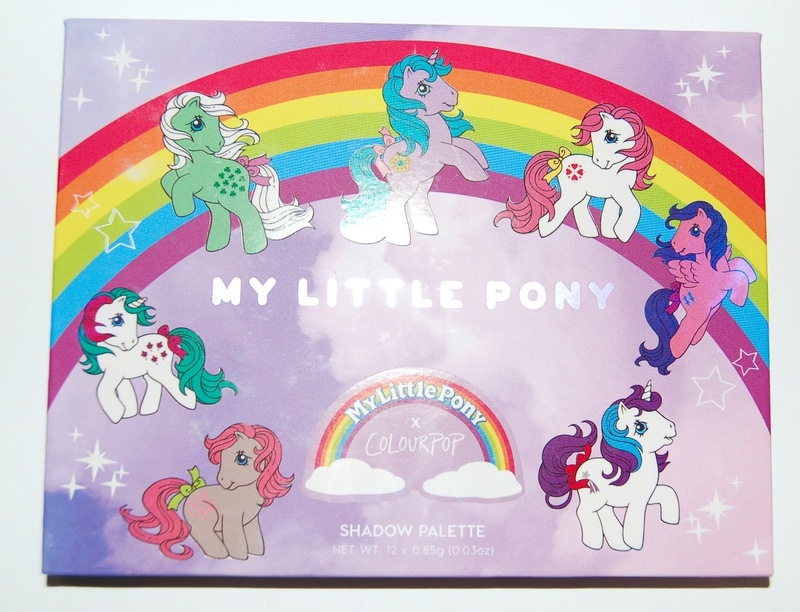 I'm secretly hoping ColourPop continues this type of collaboration with 80s cartoons and will perhaps create some products with Rainbow Brite or Strawberry Shortcake (the 80s version of course)!